An aspiring screenwriter and an up-and-coming producer share a hip Hollywood apartment with a goofy Cuban named Fidel Castro. This is a sitcom in the classic style: a catchy theme song, laugh track, hilarious situations, physical comedy, catch phrases, weekly moral lessons, and "a very special episode." Original theme song written by Bruce Dellis, performed by Bruce Dellis, Steve Francois, and Max Bullis. Seven minutes of hilarious bloopers and outtake spanning all eight episodes. Behind-the-scenes timelapse footage of building and dressing the kitchen set. The fireside pitch video that started it all. 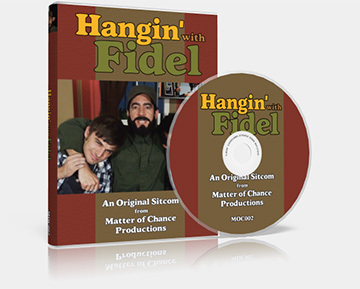 Fidel's personal pitch... and hip-hop dancing!